Nolan Ryan is considered one of the best pitchers of all time, known both for his fastball and as a role model for players and fans alike. 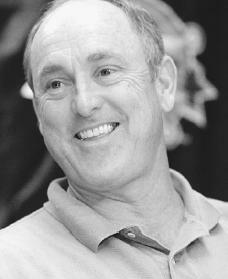 Lynn Nolan Ryan Jr. was born January 31, 1947, in Refugio, Texas. He was the youngest of six children of Lynn Nolan Ryan Sr. and Martha Ryan. Ryan grew up in Alvin, Texas, where his father worked for an oil company and delivered papers for the Houston Post. Ryan credits his father for instilling in him the value of a strong work ethic. In second grade, Ryan began helping his father on his paper routes. Much of Ryan's youth was consumed by sports. While he spent two years on his high school basketball team, it was baseball that was his passion. During his senior year, he dominated the pitching mound. He amassed a 20–4 record, batted .700 in the state tournament, and was named to the All-State team before graduating high school in 1965. Ryan was selected by the New York Mets during the 1965 free-agent draft and played in the West Carolinas League beginning on September 11, 1966. During Ryan's time with this league, his teammates began to respect his fast ball. Although Ryan lacked true ball control, he nonetheless frightened batters and catchers alike with his scorching fastball, which one day would be known as "The Ryan Express." As a result the New York Mets called Ryan up to play in the major leagues at the end of the 1966 season. The Mets at that time were in sore need of great players, because until 1969, the Mets had finished last or next to last in every season since the team was founded in 1962. Unfortunately for the Mets, the 1967 season did not bring the great play expected. Ryan was often homesick and therefore missed much of the 1967 season due to illness, an arm injury, and service with the U.S. Army Reserves. Ryan married his high school sweetheart, Ruth, in 1968. She moved to New York City to be closer to Ryan and help ease his homesickness. Along with the improved playing ability Ryan achieved during that season, the New York Mets also improved as a team. The Mets added two key people to their pitching staff, Jerry Koosman and Tom Seaver (1944–), a strikeout leader in his own right from whom Ryan learned a great deal. During the 1969 season, Ryan played as both a starting and relief pitcher, finishing the season with a 6–3 record. This type of finish soon became the norm for Ryan as he concentrated more on striking out batters than on winning games. Regardless, it was primarily Ryan's pitching abilities that took the New York Mets to the league championships that year and later the World Series. Ryan saved the Mets' bid for the World Series title when in the third game of the series, he made the crucial plays needed to earn the win. The Mets went on to upset the Baltimore Orioles after five games. Ryan, even with a world championship title to his credit, still felt uncomfortable in New York City, and requested to be traded in 1971. Without much discussion, the Mets agreed to Ryan's request and traded him along with three other players to the California Angels. Because of this move, he was able to distance himself from the East and a climate and location he was never fond of. Looking back, as players and managers often do, this trade is often considered the worst in the history of the Mets. Once in California, Ryan blasted his way into superstar status. He stayed with the Angels for eight seasons, from 1972 through 1979. With the Angels Ryan struck out more than three hundred batters for the first time. Ryan finished the 1972 season with 19 wins, 16 losses, and 329 strikeouts. With the close of the 1973 season, Ryan became the first-ever pitcher to have back-to-back seasons of over 300 strikeouts. Striking out 383 hitters, Ryan set an all-time major league record. Additionally, in the 1973 season, Ryan became only the fifth pitcher in baseball history to pitch two no-hit games in one season. The 1974 and 1975 seasons were also quite good for Ryan statistically. In the 1974 season, Ryan pitched his third no-hit game and completed a third season of over three hundred strikeouts. The 1975 season saw Ryan complete his fourth no-hit game. Ryan became the second pitcher in major league history to achieve this feat. Although Ryan played some of his best games with the California Angels, he still longed for his native Texas. His break came at the end of the 1979 season when he became a free agent. Ryan was immediately signed with the Houston Astros and became base-ball's first pitcher to earn one million dollars a year. Although this amount is common by today's standards, when it was awarded to Ryan, such a sum was unheard of at the time. Ryan pitched for the Astros from 1980 through the 1988 season. In 1981, he threw his fifth no-hitter. He led the league with the lowest earned run average in 1981 and 1987. In 1980, 1981, and 1986, the Astros were in the National League playoffs, but lost all three times. After Ryan completed his contract with the Astros, he again was a free agent at the end of the 1988 season. He was quickly picked up, this time by the Texas Rangers in time for the 1989 season. Although Ryan would not play in a playoff series with the Rangers, he did pitch his sixth and seventh no-hit games and led the American League in strikeouts in the 1989, 1990, and 1991 seasons. On September 22, 1993, on Nolan Ryan Appreciation Day in Seattle, Washington, all that Ryan dreamed of and played for came to an abrupt halt. Although he planned to retire at the end of the 1993 season, he expected to do so with the grace and dignity deserving of his accomplishments. After feeling his right elbow pop with pain from a torn ligament in the middle of the Rangers game against the Seattle Mariners, Ryan knew his chances at the World Series were over. Ryan was side-lined for the rest of the game, giving him ample time to reflect on his twenty-seven-year career. That day, at forty-six, Ryan walked off the field giving baseball and its fans something that is rarely seen. As an athlete, Ryan defined his own class and style. He attained the five-thousand-strikeout mark at the age of forty-two, when most professional sports players had long since retired. In 1999 Ryan was inducted into the Baseball Hall of Fame for playing a record twenty-seven seasons and pitching seven no-hitters. In April of 2000 Ryan underwent emergency double-bypass surgery at the Heart Hospital of Austin, Texas. After experiencing shortness of breath and chest pains, his wife drove him to the Round Rock Medical Center, where doctors performed tests. He was then taken to the Heart Hospital of Austin, where an angiogram (an X ray of blood vessels) showed a substantial blockage of the left main coronary artery. Nolan Ryan is currently a cattle rancher and a businessman. He and his wife are also active promoters of healthy and fit lifestyles for Americans. Anderson, Ken. Nolan Ryan: Texas Fastball to Cooperstown. Austin, TX: Eakin Press, 2000. Nicholson, Lois P. Nolan Ryan. New York: Chelsea House, 1995. Rolfe, John. Nolan Ryan. Boston: Little, Brown, 1992. Ryan, Nolan, T. R. Sullivan, and Mickey Herskowitz. Nolan Ryan: The Road to Cooperstown. Lenexa, KS: Addax, 1999. Ryan, Nolan, and Harvey Frommer. Throwing Heat: The Autobiography of Nolan Ryan. New York: Doubleday, 1988. Sanna, Ellyn. Nolan Ryan. New York: Rosen Pub. Group, 2002.